Cut the base off of the bok choi. Rise the leaves. Slice each leaf in half so that you separate the green top from the white bottom part of the leaf. Slice the white pieces into thin strips and set aside. Then, chop the green leafy tops, and set aside. Heat the coconut oil over medium heat in a medium-sized saucepan for a couple of minutes. Add the asparagus pieces and the white bottom pieces of the bok choi with a sprinkle of salt and pepper. Cook until they are just becoming tender, stirring occasionally, about 5 - 7 minutes. These pieces need more cooking time than the leafy greens, which you'll add next. Test a piece - when the bok choi and asparagus are just a little bit less tender than you like them, add the leafy green tops in to the pan. Stir well, and cover for about 2 minutes. Remove from heat and serve - season to taste with salt and pepper and tamari. If you have some chicken or veggie stock kicking around the house, you can make this quick, easy, and elegant soup in no time! Rinse the asparagus and cut off any woody bits at the bottom. Cut the asparagus into segments, setting the tips aside. Heat the butter in a medium-sized saucepan, when it sizzles, add the asparagus pieces, minus the tips. Sprinkle with salt and pepper. Add the stock, and simmer until tender. Purée in a blender or food processor, or in the pot using an immersion blender. Taste the soup for seasoning, and add vinegar, salt, and pepper to taste. If you wish, you can sauté the asparagus tips and use them as garnish. You can also add a bit if heavy cream, if you'd like. I know, I know...it's not the most beautiful picture. But, I promise that these baked mashed potatoes are totally delicious! Baking them makes a little bit of a brown, crispy crust on top, which adds a pleasing texture. This is a quick and easy version of a dish called "Duchess Potatoes," which involves piping the mashed potatoes into cute little piles and baking them. If you want to see the fancy version, click here. The truth is, I was going to put them in a pastry bag and pipe them, but then I realized I'd have to peel 'em, and I wanted to keep the skin on. Bring a large pot of salted water to a boil. Meanwhile, rinse the potatoes and cut them into eighths. Boil the potatoes until tender. Drain and return to the pot. At this point, preheat the broiler on high. Add butter, cheese, salt and pepper, and nutmeg (if desired). Mash the potatoes. If you don't have a potato masher, you can use a whisk. That's one of my favorite chef tricks. Thoroughly mix in the yolks. Butter a 9x13 glass baking dish, add the potatoes, and smooth them out. Broil until the top is dotted with brown. Serve. This crisp, refreshing salad is a perfect accompaniment to grilled meats. Don't have radishes? That's ok, leave 'em out. Have some crispy head lettuce kicking around, or a tomato? Throw 'em in! Cut the cucumbers in half lengthwise, and slice into half moons. Cut the radishes in half, and cut each half into slices. In a medium-sized bowl, toss the cucumbers, radishes, and shallot with the remaining ingredients. Let stand for a few minutes so the dill can begin to rehydrate. Taste the salad. Does it need more salt, pepper, acidity, or fat? If so, adjust the seasonings. These loaded potato pancakes make an incredible Sunday brunch. Make all of the toppings, whip up some potato pancakes, and let each person decide how they want to dress theirs up. 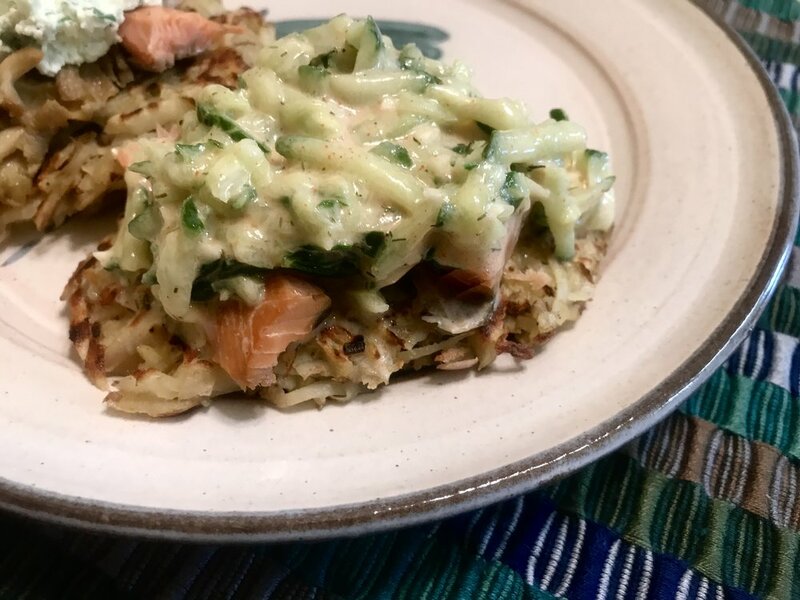 Potato pancakes, here's a recipe! Add whatever toppings make you happy! Try different combos! This is a riff on Greek tzatziki, which has some things in common with Indian raita. 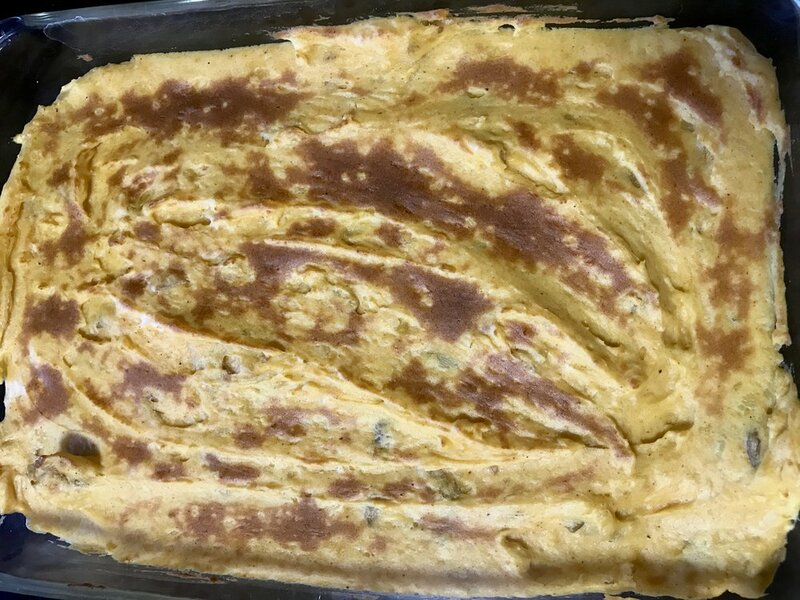 It's a combination of yogurt and cucumber, with some spices mixed in. As with many of our recipes, it's very flexible, and you can change it to suit your palate, and your mood. 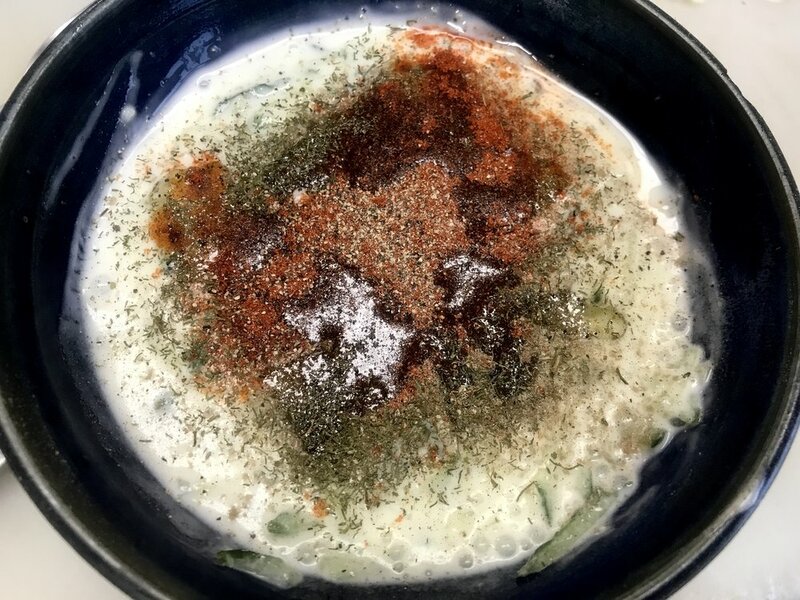 This is a very basic, rustic version of the recipe, but if you'd like, you could make it a little more elegant by starting with strained yogurt, or by salting the cucumber, letting them sit for a while, and squeezing them out a bit before adding them to the yogurt. I use this as a topping for potato pancakes, as a cooling ingredient on spicy meat or bean dishes, or eaten alone, as a snack. Herbs and spices to taste: I used dill, smoked paprika, salt, and pepper. Cayenne would be a great addition if you like heat. Ground caraway seed would be excellent, too. Rinse the cucumber, and grate it on the largest side of a box grater. Mix the cucumber and yogurt. Add oil and season to taste. This delicious concoction has many uses. Toss it with hot, fresh pasta and it will turn into a light, creamy sauce. Spread it on sandwiches, or slices of toast. Use it to stuff ravioli. Put it on an omelette, or on a salad. Eat it with a spoon. 2 scallions (I actually used the leaves of wild leeks when I made this. You could also use shallot, chives, or garlic, in place of the scallion). Dump the chevre into a bowl. Rinse the scallions and slice the green leaves into little rounds, reserving the white bulbs for another use (or throw it all in...it will be great either way). If you're using another allium, such as garlic or shallot, mince it before adding. Add some salt and pepper, and stir it all up. Taste the concoction. Would you like it to be more tangy? If so, add more lemon juice, or a splash of vinegar. Does it need salt or pepper? Add some more. You could even get really wild and mix in some hot sauce, or kimchi brine, or anything else you desire. This technique can be used for pretty much any green: think mustard, kale, chard, spinach, etc. I like to make batches of wilted greens, and put them on omelettes, add them to soup, or freeze them for later. They can become one of the layers in a cottage pie. I also eat them as a simple side dish. Wash the collards and strip them from their stems. Cut them stems into pieces. With the burner on medium, heat the butter or oil in a large, heavy bottomed saucepan. When the fat is hot, add the stems and a sprinkling of salt, and cook until tender. Then, add the leaves, and continue cooking until the leaves have turned an even, deep green, and are also tender. Taste, add salt and pepper as needed, and finish with a squeeze of lemon juice. Preheat the oven to 350 degrees, and butter a 9x13 glass baking dish. Rinse the rhubarb, cut the stalks in half to shorten them, and cut each half into quarters, lengthwise. Make 1/4-inch slices across the quarters. In your baking dish, combine the rhubarb slices with whole berries, or chopped apples or pears. Add maple syrup or sugar to the fruit, as well as the spices, vanilla, and cornstarch, if you're using it. Stir well with your (clean!) hands, or with a spoon or spatula, until all items are evenly distributed. In a bowl, combine the oats, butter, sugar, cinnamon and salt. Squish it all together with your hands, or do it the hard way and use a wooden spoon. Taste a little...does it need more salt, sugar, or cinnamon? Sprinkle the oat topping over the fruit. Bake the crisp until the topping is golden brown, and the fruit is simmering when you open the oven. I like to check it after 30 minutes, but it may take 40. This recipe is made by combining three of our other recipes: seared steak, sautéed mushrooms, and pan sauce. All you've got to do is follow those recipes, pile the mushrooms atop the meat, and pour the sauce over, and you've got a delicious main course. A basic recipe for a slab of meat! Remove the meat from its package, and using paper towels or a clean kitchen towel, pat it dry. Liberally season both sides of the meat with salt and pepper. Heat a large, heavy bottomed saucepan over medium-high heat. If you have a kitchen fan, turn it on. When the pan is hot, add the oil. When the oil shimmers, gently place the meat in the pan. If you have more than one piece, arrange them so they're not touching. Try not to move the meat around once you've put it down. Cook until the meat is seared on the first side. When it is, you will find that it will easily release itself from the pan. Flip the meat, turn off the burner, and place the pan in the oven. The cooking time will depend on the size of the steak/chop/leg, and how well done you wish it to be. You can use a thermometer to "temp" the meat, if you'd like. When the meat is done, remove it from the pan, and let it rest. You can now deglaze the pan and make a sauce, if you wish. Sautéed mushrooms are incredibly versatile. They can be used in omelettes, as a topping on burgers, to garnish salads or vegetable dishes, atop seared meats, or simply eaten as a side dish. 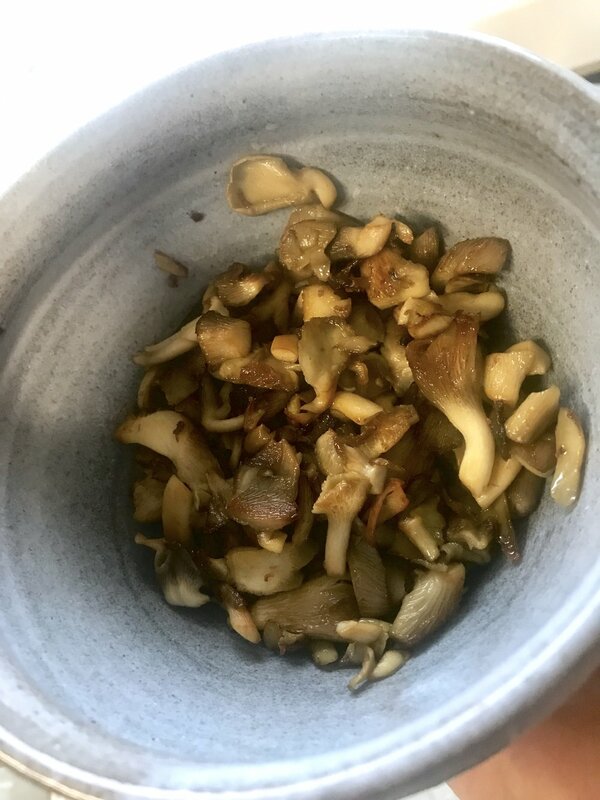 Rinse the mushrooms, pull out the stems and save them for stock (I keep a "stockpile" in my freezer, in which I save bones and veggie scraps. When I have enough, I make a batch). Slice the mushroom caps. Heat the fat in a large saucepan, and when hot, add the mushrooms, and season with salt and pepper. Cook, stirring occasionally, until the mushrooms are tender, and slightly browned. Use in whatever way suits your fancy. If you keep stock in your freezer, you can make a pan sauce at a moment's notice. It's a quick way to add incredible flavor to simple food. A pan in which you've just cooked something flavorful, such as mushrooms, caramelized onions, or seared meat. While the pan is still hot, pour in a couple cups of stock (or more, depending on how much sauce you wish to make). Simmer the sauce and let it reduce until it thickens and has the consistency of a glaze. Turn off the pan, add a couple tablespoons of butter, and whisk until the butter is incorporated. This is called "mounting the sauce." When the butter has melted and been whisked in, the sauce will be nice and glossy, and thick. Taste the sauce, and season. It's great to use acidity and salt to balance out the flavors, and make them sing. Add a little bit at a time, tasting after each addition, until the sauce is glorious. Serve over whatever you'd originally cooked in the pan, or anything that would be more delicious with sauce than without it. This is a super simple recipe that yields a very flavorful result. Just toss together roasted potatoes with chimichurri (either homemade, or from our Omnivore Package), and serve. Wash the potatoes, and cut into similar-sized pieces. (I often cut them potatoes into 16ths when I'm roasting them, but it all depends on the 'tater. Uniformity is more important than size). If you have parchment paper*, place some on your baking sheet. If not, you can do without. Put the potatoes on the baking sheet, and toss with olive oil, salt, and pepper. The potato pieces should be nicely coated with oil. Bake, stirring every 15 minutes, until potatoes are tender. Remove from oven, and immediately toss with chimichurri (seasoning the potatoes when their hot helps the flavor to penetrate). Serve hot, or at room temperature. *parchment paper is an incredible boon in the kitchen. It prevents food from sticking, which can be wasteful, and makes cleanup easier. If parchment isn't oil soaked, it can be reused. I love putting edible flowers on salads. In spring, this might mean adding a handful of violets, or sprinkling on dandelion petals. In summer, borage and nasturtium are favorites. They never fail to make people smile. Like many recipes, this one is flexible. Pick as bowl that will hold the amount of salad you think you need to feed the number of people you're feeding, and fill it up with ingredients. Let people dress their own at the table, so the greens don't wilt. Rinse the cucumber, and cut off the amount you wish to use, slice it in half lengthwise, and cut into half moons. Rinse the sunflower shoots, and dry them. Place the salad greens in a bowl, top with cucumbers and sunflower shoots, and place the edible flowers on top. *fun fact: "salad" means "salted." The Romans seasoned their greens with brine, or with a salted oil and vinegar mixture, and the name stuck. This salad dressing is nutty, with a hint of garlic. It's a great match for baby lettuce, cheddar cheese, cucumbers, and apples. This recipe is best made in a food processor or blender, because you're mixing in toasted sunflower seeds. All you need to do is combine the ingredients and blend until uniform. Taste the dressing, and see if you like the level of seasoning. Add more salt, or pepper, or mustard, or garlic, as desired. The roasted vegetable stock you received in your share makes this recipe a snap. Are you a vegetarian? This soup is excellent without the sausage, too. 1 container white beans (if you don't have beans from your share, you can substitute any other cooked beans, of any color or type). In a medium pot, bring stock to a simmer. While the stock is heating, cut the casings from the sausages, and crumble the meat into the pot. Add the white beans to the pot. Strip the chard from its stems, rinse, and pull or cut into bite-sized pieces. 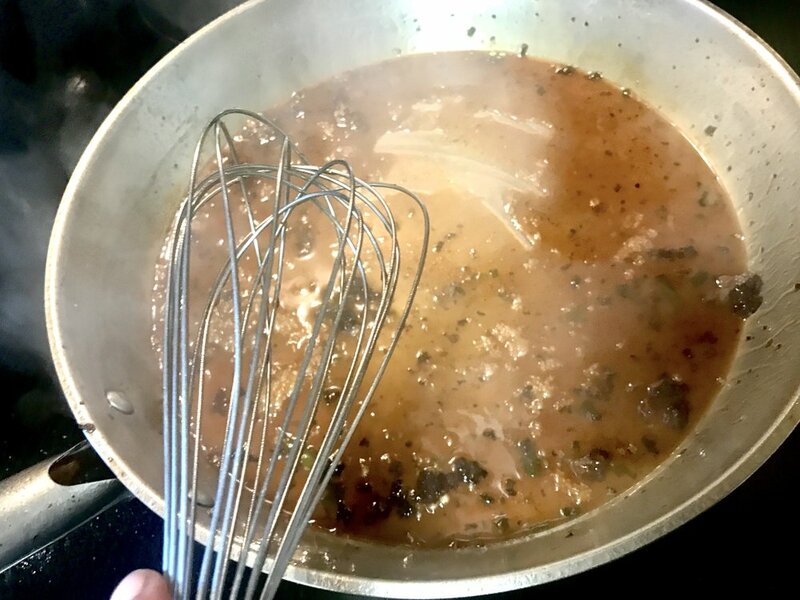 When the stock has come to a a simmer, and the meat is cooked through, add the chard to the pot. Simmer until the chard is bright green and tender. When it's done, turn off the heat. Add the lemon juice, taste the broth, and season with salt and pepper to taste. If the soup isn't tangy enough you could add more lemon juice if you have it, or use a splash of vinegar. If there's one cucumber dish that's quicker to make than quick pickles, it's cucumber salad! This variation includes dill, shallot, and some lemon zest, which gives the salad a refreshing flavor that's perfect for spring. Wash the cucumber, and slice thin with a knife or on a mandolin. Put the cucumber slices in a salad bowl. Mince the dill, and the shallot, and add them to the cucumber. With the small side of a box grater, or with a Microplane grater, zest the lemon, working gently enough to remove the yellow skin, but leave the white pith behind. Add the lemon zest to the salad. Reserve the rest of the lemon to use in another recipe (such as Sausage, Bean & Chard soup). Pour on the vinegar and oil, and season to taste with salt and pepper. Let sit for 15 minutes, up to one day, before serving. Potato and chive is a wonderful combination, and this simple recipe gives you all of the delicious flavors of a loaded baked potato, without needing to have your oven on for an hour. Check out your potatoes. Are they similar in size, or are they all different sizes? If the latter, cut the bigger potatoes in halves or quarters to match the size of the smaller potatoes (the goal is that they will all cook in approximately the same amount of time). As soon as the potatoes are cut, add them to the water. Doesn't matter if it's still cold, or already boiling. While the potatoes are cooking, preheat the broiler of your oven, on high. Slice across the bundle of chives to create tiny little rounds. Grate a cup to a cup-and-a-half of cheese. When the potatoes are cooked through, arrange them in a buttered, 9x13 glass baking dish. If you cut the potatoes to even out the sizes, put them skin-side up. When the potatoes are arranged in the dish, smash them a bit with a potato masher, a fork, or any other tool that suits you. Smash them as little or as much as you'd like. The more smashed they are, the more the toppings will mingle with the potato. Top with pats of butter, dollops of sour cream, and shredded cheese, and sprinkle with salt, pepper, and chives. If you're using bacon, you can add that now, too. Broil until the cheese has melted and started to bubble.